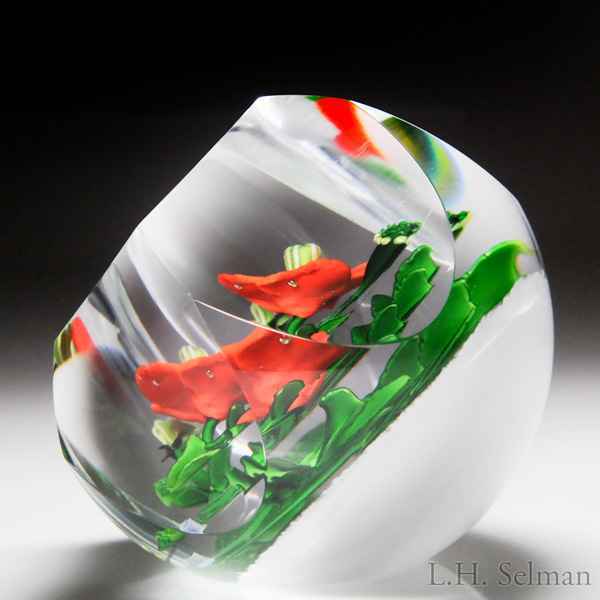 Caithness Glass 2016 “Crimson Poppy” faceted paperweight, by Allan Scott, from the Lampwork Collection. A beautiful crimson poppy, with a green, white and black stamen center, along with leaves, stems and opening buds, rests on a bed of white snow. Six concave side facets cut into top facet, plus one display facet. Edition #5 of a limited edition of 25. Signature cane. Signed/dated. Diameter 3 3/8”.